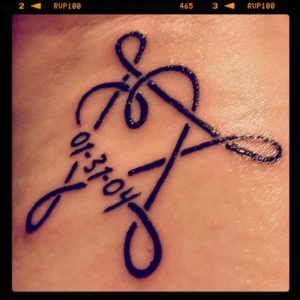 Tattoos and adoption, how are they similar? They can be a painful process and they are permanent. I have talked about getting a tattoo for a very long time but could never figure out what I wanted to get. Once Lil Miss was born, I knew that my first tattoo would be in honor of her. I had talked about doing a set of baby feet with her initials and date of birth, but never got around to really finalizing on what I wanted. Well, two years ago when I was in Charlotte for a Birthmom Buds Weekend Celebration, myself and 4 other friends went and got tattoos. We had thought about all getting the same one, but ended up with all getting something different. My first tattoo was is placed on my wrist and is a stylized version of the National Adoption Triad Symbol and then I had the artist add Lil Miss’s date of birth as well. So far this is my only tattoo but I have gotten the itch to get another one when I find someone in my area that is reasonably priced and has good line work.